Bloggers/Tweeters Unite To Help MENC – Is It Enough? There are many of us ringing the “proverbial bell” to help them and thus –Music Education in the schools. There have been a number of folks contact me personally to let me know why they were NOT voting for one reason or another -some answers dealt with their dislike of “Chase”, some aren’t “on” Facebook, and some dislike “MENC” citing various personal reasons The truth is there are a myriad of reasons that people aren’t voting, but if you can’t come up with one and you’ve read through all the related materials, love music, and support music education… I keep thinking: Was the 10 seconds it takes to click a vote button just too long to secure a vote? – Since Facebook is giving everyone FIVE votes so that everyone can vote for all of their favorite charities …it can’t be a moment of indecision between one or another… nobody’s even asking for anyone to dig “deep into their pockets” for personal financial support… It’s all somewhat baffling to me given the almost universal agreement for supporting music education by arts advocates right now. Can we still win this? Yes, we can! Now, on the downhill-side of our efforts, I can see that moving this “mountain” is indeed becoming a formidable task. If MENC cannot inspire it’s own base to move forward (over 10,000 folks Liking MENC on both their own Facebook site and collegiate chapters), ” we” may not be a winner in the 2nd round (speaking as a member of MENC). Can we still win this? Yes, we can! (reminds me of a kids’ show – Bob the Builder). 1. 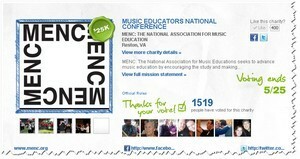 Mustech.net: Win One for Music Ed. and $500,000 For Menc! If I missed your article or post, it’s because I didn’t get Tweet from you (apologies). Please, feel free to post a link to your article in the comment section below. If you haven’t written one, MENC could really use your support right about now! There are only 2 and 1/2 days left to vote as of this posting. The great thing about this campaign is that, regardless of the outcome at this point, we’ve already won $25,000 for a great and worthy cause – MUSIC EDUCATION and in addition; we’ve reached out to thousands of people to make them more aware of how important music is –especially in today’s educational climate with regard to the current disbanding of music programs across the U.S. Hopefully, we’ve planted a seed in those impacted by this campaign about the importance of keeping Music Education in the schools and at the forefronts of any of their thoughts concerning current and future educational curriculums. Thanks to all of the bloggers and the folks tweeting and posting for this deserving campaign! We are always “talking” about the need for music advocacy… here’s just one of the many chances for us to advocate! Keep it up – spread the word!